Demonstrating their ongoing commitment to the subsea and marine sector, Dana’s UK team had a productive time at the recent Subsea Expo in Aberdeen. 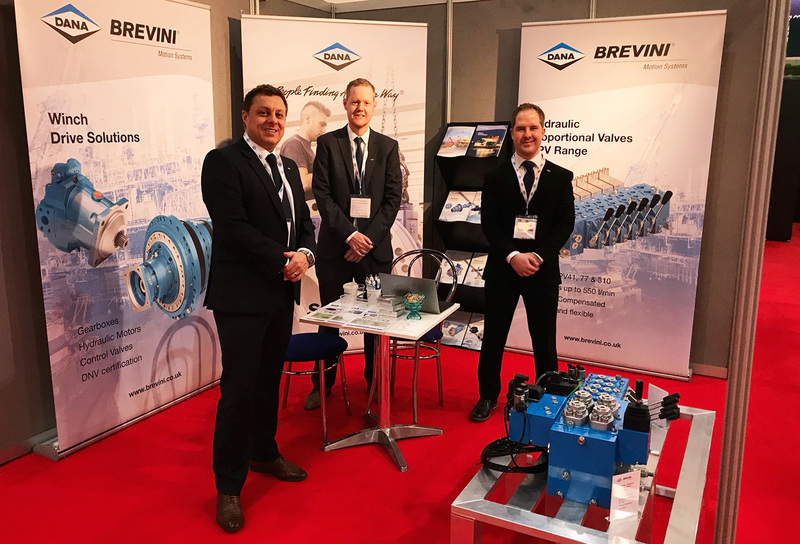 This is, undoubtedly, a time of significant change and development for the UK’s marine and subsea industry, and it is also a time of growth and investment for Dana in the UK, building on their acquisition of Brevini last year. The Dana stand at Subsea Expo featured the HPV 310 proportional directional valve, and Dana’s team were on hand to highlight the range’s many features to potential new customers, as well as catch up with existing clients. Very well-received at the Expo, the specification and applications of the HPV range have generated new leads and enquiries for Dana, from a busy few days. At the Subsea UK Awards, Dana were delighted when their customer, Maritime Developments Limited (MDL), won the Innovation & Technology Award, for their portable vertical lay system. Dana were privileged to have supplied the track drives and winches to MDL for this innovative product, and the team at Dana congratulate the company heartily on this prestigious win.